“To be frivolous about frivolous matters, that’s merely boring. To be frivolous about something that’s in some way deadly serious, that’s true comedy.” So said Alexander Mackendrick, who directed the 1955 film upon which Graham Linehan’s 2011 stage adaptation is based. Farce requires dangerIt requires an expertly balanced combination of drama and comedy played at both extremes. While I have no doubt that the cast and creative team behind The Ladykillers understand this, the robust logic that provided the safety net for Linehan’s adapted plot (as the playwright discusses in this Guardian article) is the same upon which directors Colin McColl and Cameron Rhodes have relied to present this production. By doing so, the play ticks along comfortably as the cast waits for the next plot point to carry them through to the next scene. It is this comfortability, this safety, and this lack of risk that sits in heavy contrast to the concept of the Auckland Theatre Company’s 2015 Reinvention season. 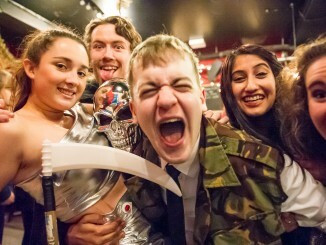 This reliance cannot be due to a lasting confusion by artistic director McColl’s childhood experience of the film, as that belies his appreciating the acceptance of the genre and the purpose of its programming. 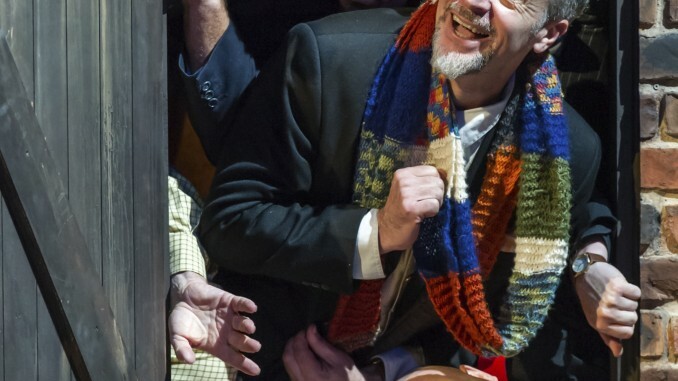 Show bibles are notorious on the West End, and while there is freedom in structure and creativity in restriction, we have in New Zealand the opportunity to turn even an Ealing comedy set in King’s Cross into something of our own. But if you happen to have seen this play before, then you’ve seen this show. If you happen to have seen a play since 1930, then you’ve seen this show. Annie Whittle, who is at least a decade too young for the role and looks even a decade younger than that, phones in a character with all the Wilber-force of a dial tone, leaving the entire responsibility of driving the play on Carl Bland’s shoulders. Said shoulders are draped by the luscious costuming of Elizabeth Whiting, who provides the only sense of reinvention and imagination in this production. At times the demand on Bland peaks and he gives way to falsity, but he always manages to rope himself back before the show gets away from him. The cast proves the physical and intellectual demand of farce an achievable one thanks to Michael Hurst’s signature stunt choreography and their own natural timing, but it is only Peter Hayden and Byron Coll who find any emotionality and consequently more resonant humour in their roles. Whatever doesn’t purposely break or shake in Rachael Walker’s intricately constructed set is chewed up by Toby Leach, whose throw-a-dart-at-a-map-of-Europe nasality results in a French resonance as opposed to the referenced Romanian, and, while ATC veteran Andrew Grainger can play farce in his sleep, I resign myself to the fact that the company might never cast him with the challenge he deserves. Costumes aside, there is nothing original in this production. There is no dynamite under The Maidment boards and consequently no spark or imagination. This lack of personality has bled into the cast and results in excellently executed yet predominantly two-dimensional performances. When combining the dramatic irony of Bland’s direct to the audience remark that “being fooled by art is one of the primary pleasures afforded to the middle classes” with “the finest trick of the devil is to persuade you he does not exist” by Charles Baudelaire, the backdrop to the premiere of this Reinvention season reveals everything and nothing as it collapses in on itself – farcically, of course. 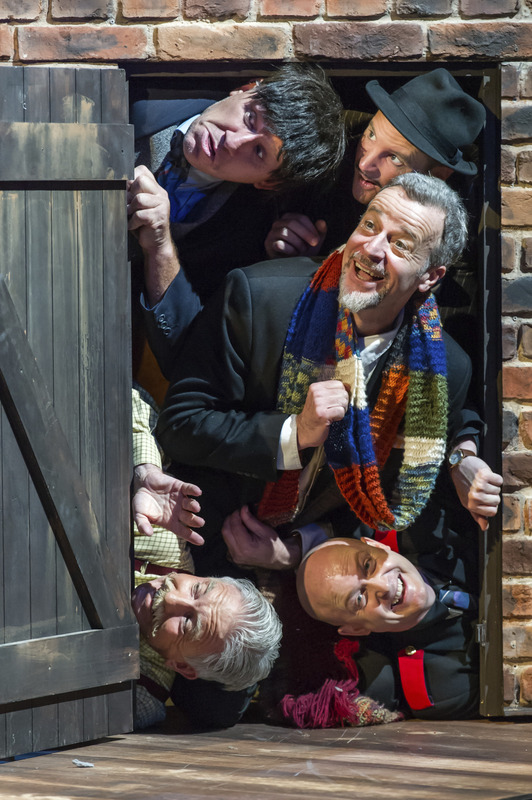 The Ladykillers is presented by ATC and plays at The Maidment until March 7. For more details see ATC.